Gingivitis is a mild, often reversible form of gum disease. 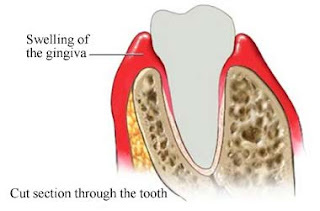 In gingivitis, there is inflammation of the gum tissue, which surrounds the teeth. If left untreated, gingivitis can progress to the support tissue and bone, a serious condition called periodontitis. Gingivitis is caused by a substance that forms on teeth called plaque. Plaque is a sticky material, composed of bacteria, mucus, food, and other substances. It hardens to form tartar. When plaque is left on the teeth for an extended period of time, it can lead to gingivitis. Toxins produced by bacteria in dental plaque irritate the gum tissue and cause infection, inflammation, and pain. Gingivitis is often painless with symptoms developing when it becomes worse. The dentist will examine your teeth and gums, assessing for swelling and areas where the tissue is pulling away from the teeth, forming a pocket. Early diagnosis of the problem enables prompt treatment and the possibility of reversing the condition. It is important to see your dentist every six months for a cleaning because gingivitis may have no symptoms in the early stages. Thoroughly brush and floss your teeth. Use a soft-bristled toothbrush held at a 45° angle to the line where your teeth and gums meet. An electronic toothbrush may make brushing easier for patients with physical limitations. Replace the brush when the bristles become bent or frayed. Move the brush in small circular movements along the gumline and chewing surfaces of your teeth. Brushing removes bacteria from the teeth, but the brush cannot reach everywhere. Flossing helps rid food and bacteria between teeth. Hold the floss tight. Gently bring it down between the teeth. Do not pop the floss against the gum. Curve the floss around the tooth and rub up and down. Adjust the floss, so you use a fresh section for each tooth, including the back side of the last tooth, left and right, upper and lower. The dentist may recommend additional self-care treatments, such as massaging the gums with a rubber tip. Rinses to fight bacteria and plaque build-up may help some patients. Dental health professionals check for gingivitis and remove plaque that has built up on teeth. A visit every six months is usually considered adequate. Patients with gingivitis may need more frequent cleanings. If the disease progresses and plaque builds up below the gum line, the area must be scraped off and smoothed with dental tools. Otherwise, accumulated plaque and tartar buildup make it easier for bacteria to grow. If an area has progressed to periodontal disease, surgery or medication may be required. Treating an underlying medical problem may improve the health of your gums. In patients with recurring gingivitis, the dentist will evaluate whether some other condition may be contributing to the gum disease. o Brushing teeth twice daily. There is some data that rotating oscillating electric toothbrushes are more effective in controlling gingivitis than “normal” brushing by hand.